The Camelbak BFM is one of the most popular large Camelbak backpacks we offer. With the large cargo space and water reservoir this backpack is great for longer excursions. Camelbak BFM 100oz Hydration System is the ruck sack you need when you're on a long mission and always on the move. The Camelback BFM Water Pack will support your extended operation. The BFM Hydration Pack is Camelbak's largest system, with a versatile load configuration design that can carry it all comfortably. The Camelback BFM Pack lets you pack out 2600 cu. in. (4.2 L) of gear and up to two 3-litre reservoirs of water internally. CamelBak® is the leader in hydration backpacks. CamelBak® products are always equipped with the latest technology and innovative features that make CamelBak® above the rest. 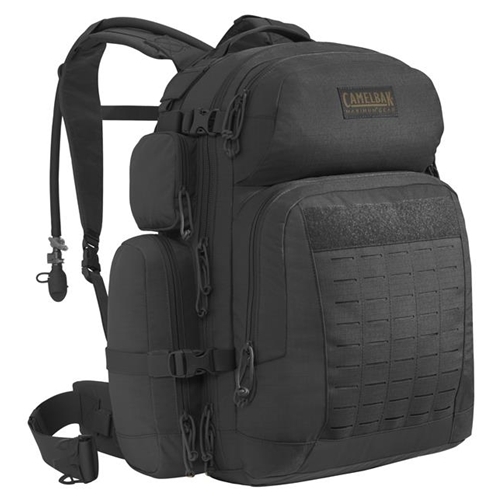 Virtually all backpacks have reservoir features such as, Easy-to-fill and clean wide-mouth OMEGA® opening, rugged and durable Water Beast™ material, leak-proof screw-cap, insulated PureFlow™ tube, patented Big Bite™ Valve, HydroLink™ Exit Port and Drink Port and HydroLock™one-handed flow control. Choose from their top packs such as the BFM, Motherload, HAWG, MULE and Linchpin. CamelBak® Got Your Bak™ Guarantee. If they built it, they’ll Bak it™ with their lifetime guarantee.